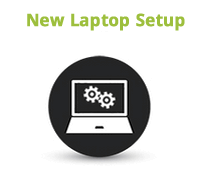 Did you just buy a new laptop and want it set up professionally? In this case, we will create new user accounts, remove all "bloatware", the unnecessary software that is installed on new laptops. Additionally, we will install useful utilities and applications, optimize your new laptop for optimal performance. We will also setup your email accounts and setup your email application. We are a true nationwide provider of setting up new Laptop repair, Laptop professional repair services as well as iPhone repair. Besides repairs at our Laptop repair services, Laptop repair, PC Computers and laptop repair service center in Bellville Cape town, we have setup new Laptops for customers all over South Africa including Johannesburg, Pretoria, Durban, Kimberly, Bloemfontein, Port Elizabeth, Polokwane, Pietermaritzburg and Nelspruit plus many other South African cities. If you would like to use our professional new Laptop setup services but don't live close to our Laptop repair service center, click here for information on sending us your iPad for professional repair through our express courier service. We can usually set up your new laptop in 3-4 hours. The service price is for setting up your new laptop. It does not include price for any paid for applications or anti virus software.